It was there on 3/19 fwiw. Right next to the Starbucks. Somebody please go up there with some Motzenbocker's Lift-Off assh0le remover -- I mean, graffiti remover -- and a wire brush. The sooner, the easier. Lacquer thinner is often useful -- there are new formulations without toluene (which I think is the most toxic component); they're mostly acetone and MEK (methylethykl ketone) and don't work as well. Also take bear mace in case you ever catch a graffiti vandal. Guns or knives if you have a really good lawyer or there are no witnesses. I'd love to have my freezer full of graffiti vandal -- it would feed Al for the rest of his life. A corgi will eat anything, anything, even a graffiti vandal. Why couldn't they just contribute to the established graffiti receptacle at the base of the rocky area? This photo is from 2013 and I don't have a more recent one but the sign is unreadable now. At least if it's all in one place it's not as annoying. 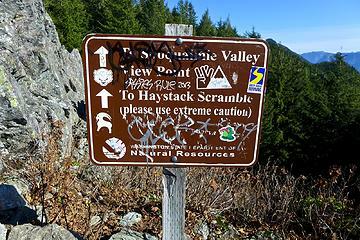 Removing graffiti from the rocks near the summit area on Mailbox has become a regular burden for a group of frequent hikers there. I checked out the manufacturer's website; impressive if it works that well, even on porous surfaces. Wouldn't mind having some along on hikes as I'm constantly running into graffiti now; although some of it's carving. Checked out the MSDS sheets for Motzenbocker's - the key ingredient seems to be acetone (plus secret proprietary stuff). Re your other comment, though - MEK is equally as nasty as toulene. A bosun I worked for used to warn us about getting it on our hands - then one day I caught him washing a brush w/o gloves in the stuff. Some people treat wild areas as a city park. Heck, why would somebody even treat a city park that badly? Anyone around here in their ... cough, cough ... seniorhood who's been getting out for enough years that they can recall when the trails and back-country weren't as plagued by so much of the "wrong element"? Some would say it's connected to the population growth (so % of assholicism out there increases proportionally). The Insta-selfie-Twitter bots don't help, but it seems to be more than that. I occasionally hear stories about the halcyon days when you could leave a car at a TH, never had to worry about vandalism, and litter/graffiti was a rare thing. Maybe we could get Motzenbocker's to donate a few cases for an official NWH trail graffiti cleanup day. Document it all in a collective TR. Sorry, but none of this is new. I had gas syphoned from my car in the Chants before permits were required. Cars have been broken into at trailheads for as long as there were trailheads and cars. Graffiti was present in parks forever back in the day it was even encouraged by authorities and techniques taught in Boy Scouts and hiking books. Leave no trace is the new thing. This was posted on the FB page as well. I may not have anyone rocking my world right now but, I don't have anyone messing it up either. Sorry, but none of this is new. I had gas symphonies from my car in the Chants before permits were required. Malachai, your gas symphonies had me ROTFL. I've had gas symphonies too, but I'd never admit to any specific occurrence. Which one is THE FB page? hopefully it didn't post to WA H&C. most of the users over there are so dumb they won't read the words and take the picture to mean this type of behavior is just "what you do" in the woods. 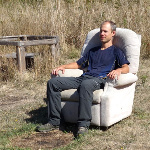 There's a thread over there with a competition to see who can tag the most remote peak, and another for the most summits. A third contest is for poetic value.